Packt Publishing is at it again. They've published David Mercer's follow up to Drupal: Creating Blogs, Forums, Portals, and Community Websites, which was originally based on Drupal 4.7. 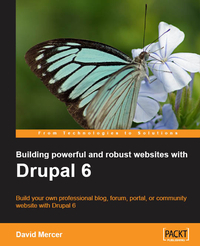 The new book subtitled Build your own professional blog, forum, portal or community website with Drupal 6 tries to cater to the same audience but with greatly updated content. David seems to be completely up to date on the Drupal 6 matters, as much as the March 2008 publication time allowed. This was one of the first Drupal 6 books on the market, and the author even managed to include a lengthy section on CCK. Hats off. Now that Views 2.0 is out for Drupal 6, many more people will consider using this new version as a base to start with. David caters to new users, not upgraders though, so this guide helps you get up to speed (and the Views covering books are still awaited on the market). The book has a certain eye to detail in talking about things like setting up users and permissions. David even goes to note that setting up access rules for names or emails does not affect existing users. This practice was changed in recent Drupal versions, considering this a security bug instead of the way how Drupal works, and honestly, I don't think people expected to see this behavior noted in print. This attention to detail goes to extremes however in the examination of taxonomy. To my tastes, it would have been better to get down to more practical examples sooner instead of trying to organize the section around the theories of taxonomy. Same applies to coverage of HTML, where David tries to teach content producers certain HTML tags to write a feature-rich webpage. This might be a good idea for the theming section, but not where content is produced by end users. All-in-all, I think this book is a good starter guide for Drupal 6 users, even if sometimes too detailed. You'll certainly need to be ready to learning a lot more from Views to CCK field modules while you actually build a more complex site, but starting off with a simpler website should be possible from the topics covered.